Today I started working on first TAST sampler on this year. The stitch belongs to the chain stitch variety, called linked chain stitch. Fairly a simple stitch, the working of which is available on SharonB ’s blog in the TAST category. The details-1. I started with the basic linked chain in the first sample, working a longer version of this stitch in the second sample and with the stitch length being the same I moved back further into the previous stitch in the third row. 2.This stitch is worked in curves in the first sample, it is laced with rimjim thread in the second sample, and whipped on both sides with perle cotton in the third sample. I wanted to try the zigzag version on this stitch in the first sample, the stitch is actually worked in two angles in this row. This was interesting, it looks like chained feather stitch. 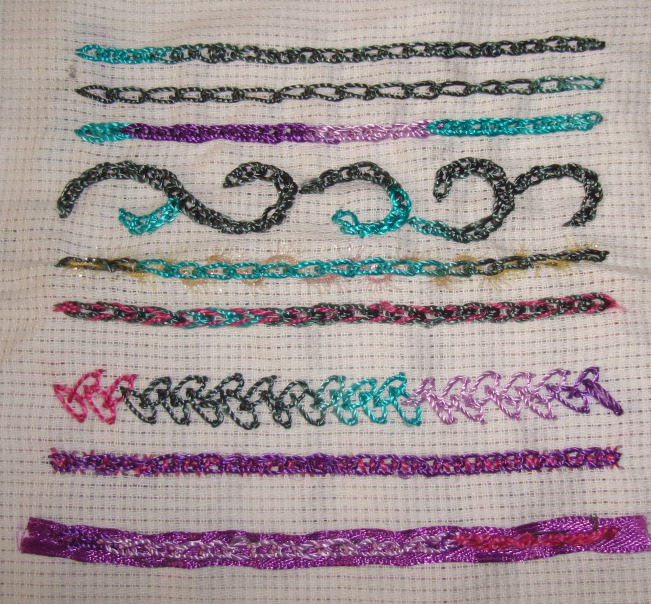 In the second row, the stitch is worked over straight stitches, similar to raised chain stitch. the stitch worked over a satin ribbon in the third sample.